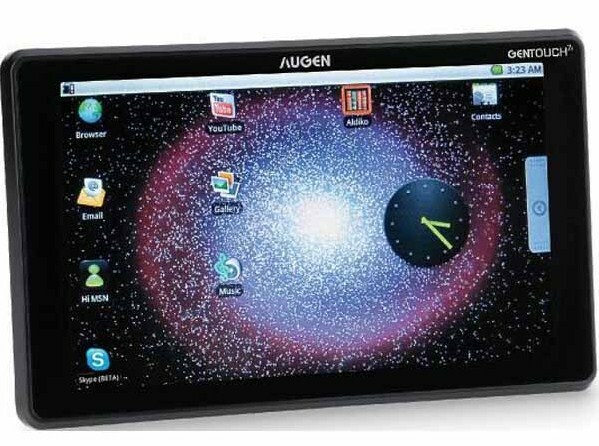 Augen to launch a low cost tablet "GenTouch78"
Not many may have heard of Augen before. It surely is not amongst the most well known companies around the world though it seems they have stepped up efforts to become one. Its not too long before that they emerged in the e-reader segment and now, they have poked their nose in the perhaps even more competitive tablet PC arena. And to carry forward their dreams in the tablet PC segment, that have armed themselves with a 7 inch tablet named GenTouch78 running the Android operating system, version 2.1. The GenTouch78 tablet’s 7 inch resistive touch screen has a resolution of 800 x 480 pixels and has a 800MHz processors of an unknown make at its core. Coupled to the processor is a 256MB of DDR2 RAM while on board storage amounts to 2 GB though it can be jacked up further to 16 GB by way of SD/MMC cards, the slot for which comes as standard. Augen has also stated the GenTouch78 has 720p video support while connectivity options with the tablet is restricted to just WiFi support. The tablet will also be able to play back multimedia files and take up the role of an e-reader as well, capable as it is to play e-book files. However, the one area where the GenTouch78 scores is the fact that the tablet will have full access to the Android Market, which means there are a cool 70,000 apps to choose from. And then there is the cost aspect of the tablet as well. Or shall we say the low cost aspect as Augen has kept the price of the tablet to a highly affordable $150. The GenTouch78will be made available through Kmart outlets and shipping is slated to begin soon. There is no news though if there’s an upgrade to the Android 2.2 version planned for sometime in future. Also a leather carrying case comes bundled with each purchase.